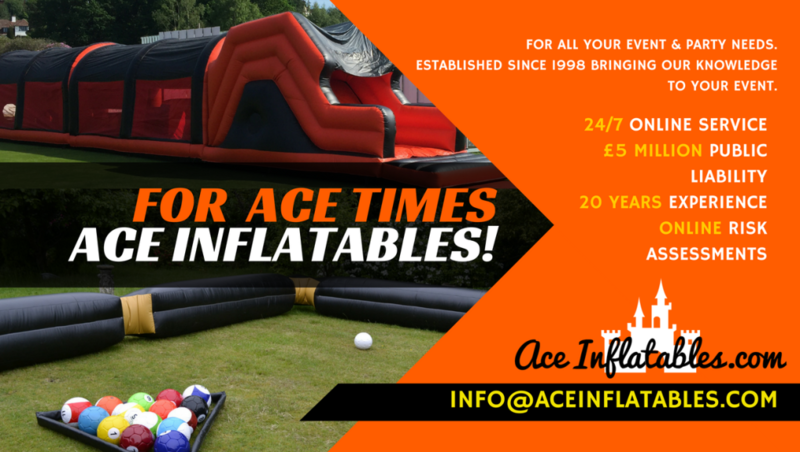 For an Ace Time, Ace Inflatables Ace Inflatables has been in the industry for 20 years making us one of the leading & longest hirers in the South of England; Our Team believes in providing an excellent, reliable service, and fun times, at an affordable price! All our inflatables are manufactured by our in-house manufacturing company giving us a large knowledge of inflatables to pass and exceed the industry level of safety & guidelines. BSEN 14960-2006/2013 standards. A legal requirement all hirers should work too. Making sure your Event runs smoothly and safely. All are stock built out of the finest materials and are tested annually. All electrical equipment has been PAT tested. We hold £5million public liability insurance. Also, we have online Risk Assessments & Method Statements too. We are active members of many trade bodies, including British Inflatable Hirer Alliance and Bouncy Castle Network, The Inflatable Play Enterprise to name but a few. Any Questions visit our website and use our 24/7 online chat to speak to a member of our Ace team! Welcome To Ace Inflatables We are a family business with fun running through our veins. We have been supplying the newest and the best bouncy castles and inflatables games since 1997, in and around East Sussex. Including; Uckfield, Heathfield, Crowborough Battle, Burgess Hill, Eastbourne, East Grinstead, Hastings, Hove, Tunbridge Wells and surrounding villages. About Us We have worked with large and small companies, Scout and Guide groups, churches and other organisations helping them with fun days, charity events and staff reward days with great success. making us the go to company, when you are looking for your inflatables. We don't just supply inflatables we deliver a stress free second to none professional hire service. Can't see what you are looking for then please give us a call as we are always adding new stock.